How to encapsulate the events of the past ten years into a short talk, when you are all looking forward to a refreshing drink and a good dinner was never going to be easy and could easily appear to be a succession of boasts. So before picking out what I regard as some of the highlights of my time as Provincial Grand Master I would like to emphasise that this has been a team effort and I acknowledge all the detailed work that has gone into these achievements by all the Provincial officers, past and present, senior and junior, without whom, none of this would be possible. I came into office on the back of a 4-year stint as Provincial Grand Secretary and prior to that a 6-year stint as the Deputy Provincial Grand Secretary. Having said that I would like to pay tribute to my predecessor, Bro Keith Emmerson, for bequeathing to me a soundly based and happy Province. The transfer of responsibilities was an easy and painless one. An immediate change was to alter the manner in which the Province was toasted at the Festive Board. I was concerned that on many occasions there were very few brethren present who were not Provincial officers, who stood for this toast and many of them were new and somewhat exposed when giving the fire. So, I changed the arrangements so that all brethren, whatever their rank, would stand to toast the Province apart from me or my representative who was due to respond to the toast. At the same time, I insisted that there should be no separate toast to me. This has proved to be a highly successful change and I note that it has been copied by some other Orders within the Province. The first significant policy was to review the timing of the award of Provincial honours. 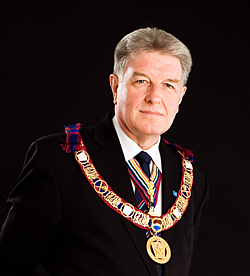 It was clear that our then arrangement of appointing brethren to Provincial Grand Rank when they were the IPM or sometimes still in the Chair of their lodge was preventing the Honours committee from assessing individual capabilities and it was agreed that steps should be taken to extend the period between leaving the lodge chair and receiving Provincial rank. Bro Colin Hellyer, then APGM, was asked to draw up a scheme whereby the award of Provincial rank would be made at least 3 years after leaving the Chair. Having approved the scheme we then embarked on a tour of all the centres in the Province to explain to the brethren what we were doing and why. This whole process has been well received and understood with the result that there is now a gap of 3 years between leaving the Chair and being considered for Provincial Grand Rank. The second most important development has been the introduction of Centre based PGM’s LOIs across the Province. We started at Watford and have rolled this scheme out in Cheshunt and recently in St Albans. Accompanied by a detailed and informative website it has proved to be a great success attracting significant numbers of brethren to each meeting. The consequence of this project has been a noticeable improvement of ritual standards in many of our lodges and a small but steady increase in the number of candidates coming forward for advancement and an increase in the number of members attending meetings of their lodges. Bros Roy Moth and Maurice Smith have led this project and continue to have oversight with Bro Roger Outram having designed and set-up the associated website. Shortly after I came into office, Bro John Oakley-Smith, then my Deputy PGM and a distinguished Past Master of this lodge, set in train, with my blessing, the process by which this lodge ceased to operate as a private lodge and became a lodge through which major Provincial announcements could be made and would serve as a primary Provincial service lodge. This process has developed as the years have passed and in that time Herts Mark Masters has become a Keystone lodge within Mark Grand Lodge. Over the years I have had the privilege of consecrating 3 new lodges in the Province, Rudyard Kipling Mark No 1947, Stanstead Abbotts RAM No 1809 and John Burr RAM No 1824. All three occasions were very well attended and the lodges are now flourishing. Furthermore, we amalgamated the three Mark and RAM lodges meeting at Letchworth into one Mark and one RAM lodge, an event which required the writing of a completely new ritual. I have also been able to dedicate a considerable number of new lodge banners, too numerous to mention individually here, but all these banners have been dedicated as “white table” events with wives, children and non-Mark Masons being present to witness our ceremonial and join us for dinner or lunch after the ceremony. The involvement of the Provincial officers in these events was expanded further with the annual demonstration of the Mark advancement and RAM elevation ceremonies being undertaken, usually with actual candidates, the work from the Chair being performed by a Provincial Grand Steward of the year and the active Provincial officers fulfilling their respective Provincial offices in the ceremony. We have also expanded the visiting rota so that all the active Provincial officers of the year can join the PGM or his representative when visiting a lodge (at his own expense of course!). We have launched a Provincial website with Bro James Davis acting as webmaster. The major charity initiative during the past ten years has been the investment in the Scout campsite at Tolmers. Our support has enabled the Scouts to install the necessary utilities to enable the site facilities to be used throughout the year making the whole site financially viable and benefitting children of all ages, backgrounds and abilities. Your generosity has led, indirectly, to the consecration of the Rudyard Kipling Mark lodge and encouraged many scout leaders connected with the site who were already members of the craft to be advanced into the Mark degree. We have also supported the Blood bikes of Hertfordshire before it became fashionable to do so through the Mark Benevolent Fund. At the University of Hertfordshire, we have continued to support the student who has been chosen to receive our Mark Masons’ of Hertfordshire scholarship and have heard an address from two of them at Annual Meetings of Provincial Grand Lodge. We have continued to offer various social events with regular lunches and dinners, a weekend away in Dublin and the introduction of the annual visit to the Varsity Match at Twickenham. Finally, and of considerable interest to every brother present, we have managed the Provincial finances in such a way that it has not been necessary to increase Provincial dues during my time as Provincial Grand Master. This has been achieved by cutting costs without cutting back activities, most notably by introducing advertising into the Annual Meeting paper of business with a consequent reduction in the net cost of the Provincial Annual Meeting. I hope I have been able to build on the firm foundations laid by my predecessor, however I wish to pay tribute to all the brethren with whom I have been privileged to work. As you all know, there is no “I” in team and I have had a very supportive and active team throughout my time as Provincial Grand Master. I also wish to thank all the wives and families who have been such a strong support for the Provincial team. Without them we could not have had so much success and enjoyment. I hand over a Province with a sound balance sheet, solid finances and I hope a happy membership. It has been a lot of fun, but more importantly a privilege to serve you and I thank you all for your support and friendship.